One of the great stories of the internet a few weeks ago involved a preacher, a waitress and a meal receipt. 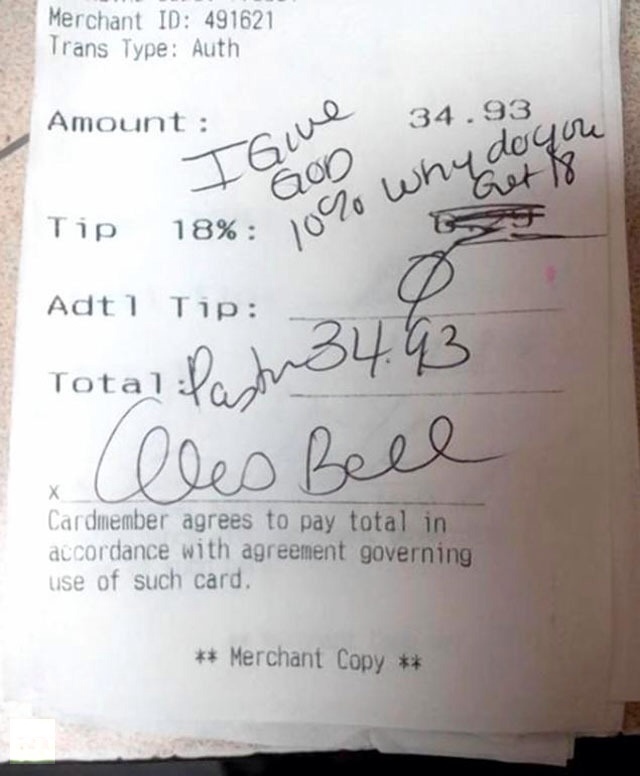 A St. Louis minister dined at an Applebee's restaurant with 19 parishioners and when presented with his check refused to to honor the mandatory 18 percent tip. He wrote that he gives God ten percent so why should he give her 18? Then, instead of giving ten percent, he gave her nothing. She posted a copy of the slip to the Internet, the post got thousands of hits and she was fired for her efforts. Finally, the pastor apologized. There is a lesson here on Christian charity. Not just because Jesus admonished his followers to “Give to every man that asketh of thee.” (Luke 6:30) There seems to be a fundamental lack of understanding of generosity and service. When I was in college and working at the Morningstar Coffeehouse in San Marcos, my fellow worshippers and I would often go out in large groups and at the end of the meal they would tip the waitress with Bible tracts. Their rationale? The waitress needed Jesus more than she needed money. It never dawned on them that Jesus may have sent us to meet the waitress' financial needs. Nor should we forget that Jesus holds those who serve in higher esteem than those who are served. There are other realities that we overlook should we refused to tip our severs. When we tip, we don't just tip the server. She has to share with the host, bartender and bus staff. The server isn't provided by the restaurant as a courtesy. We are his employers. When we place an order we are contracting with the service staff. They are not serving us for free because they have nothing else to do. This is how they earn their keep, and to fail to tip is to steal from them. We are now entering into the territory of Old Testament, ten commandment transgressions. To refuse to tip is to be more than simply ungrateful. It is to be a thief. We are robbing them of time and money they could have earned serving someone that would have tipped them. The ten percent rationale is also faulty math. Wait staff used to get ten percent too. But tips have been adjusted for the cost of inflation. First to 15 percent and now to 20 percent. And servers do more than serve the food we pay for. They lay down plates and utensils, clean up our messes and even continually offer free bread, condiments, water and drink refills. So it is far from unreasonable to give a waitress 18 percent when God only demands a tithe. We should count ourselves fortunate. If God adjusted our tithes for the cost of inflation over the three thousand years since the Torah was passed down, we would be giving 600 percent or more of what we earned. Compared to that, 18 percent is a pittance. And the disciples were astonished at his words. But Jesus answereth again, and saith unto them, Children, how hard is it for them that trust in riches to enter into the kingdom of God! It is easier for a camel to go through the eye of a needle, than for a rich man to enter into the kingdom of God. And they were astonished out of measure, saying among themselves, Who then can be saved? And Jesus looking upon them saith, With men it is impossible, but not with God: for with God all things are possible. We are currently in the middle of a debate about the best way to make government solvent. According to many in the Christian Right, the best way is by sacrifice. Not self-sacrifice, in which, we pay more taxes, but the sacrifice of others we don't care about who receive benefits from government. I'm including the sacrifice of money to educate other people's children, money to take care of veterans, money to support the families of soldiers, money to insure the health care of those most in need. The message of the Republican Right, and that includes the Christian Right, is of the preservation of wealth. And those who are willing to pay more in taxes to make sure that the needs of others are more adequately met are considered to be anti-Christian and even anti-American. I find this message ironic coming from the mouths of those who profess that America was founded as a Christian nation. Nowhere do we hear the rich and powerful consider sacrificing their wealth. Not even offering the sacrifice in the manner of Isaac and his son. They are not even willing to put their wealth on the altar with faith that God will return it to them. No, they insist wealth is their god given right. Which it may be, but according to Jesus that wealth was given in order to take care of the poor. It is easy to claim that care of the poor should come at the hands of private charities, not bloated government bureaucracies. Yet private charities are also bureaucratically top heavy (I know, having worked for them) and often depend on government funding as much as private support. I am all for a balanced budget, but I am willing to pay my fair share rather than carve it out of the backs of the poor. And I think I am following the path set out in the Gospels to suggest as much. A recent Texas Freedom Network report indicated that Texas public school Bible courses frequently ignore state standards for rigor and objectivity. The classes least in compliance tend to promote the views of the Christian Right. Even instructional materials are often taken from the teacher's churches and not academic publishers. This should hardly be surprising. In Texas, teachers answer to a higher call than the Legislature. Far be it from a few laws to stand in the way of truth. Our children could be corrupted by false ideologies. Like evolution. Ironically for Catholics who have thrown their lot in with the Christian Right, the classes that are least in compliance promote a distinctly Protestant flavor of the Bible. Catholics aligning themselves with the Right probably don't care, but more traditional Catholics might. The state guidelines were written to ensure the religious freedoms of all students, but the Christian Right and the Corporate Christian Complex (CCC) who backs them believe the only people who deserve religious freedom are themselves. I will grant that the courses are elective, but I also want to stress that the courses are offered as English or Social Studies courses, not religion courses. The intent was to allow students to become familiar with or to understand the influence of the Bible on culture and society, not to convert them to the faith. Ironically, it is the Christian Right that uses objectivity as the standard for including creationism in science classes. The truth is that the Christian Right only wants what serves their interests. Texas colleges used to offer elective Bible courses at a college level. But these were a sop to Christian lobbyists. They were always taught by the Baptist Student Union or other campus Christian groups and promoted a fundamentalist interpretation of the Bible. Baptist kids like me took them for free credits, even though Catholics, Muslims, Jews and Atheists weren't allowed to take courses of their own. Other kids took them because they were easy to pass even when hungover. For Jesus, his Jewish predecessors and the apostles who followed, teaching scripture was not the function of public institutions. Children were raised with the faith in their homes and synagogues. Children were expected to encounter a hostile and foreign world outside even in Jerusalem, for it was inhabited by foreign powers. Children of the Christian Right are still taught the Bible in their churches and homes, so they don't need Bible classes. Nor should they get them for a free credit. But if they don't really need them, why do they want them? Only one answer comes to mind. The Christian Right wants to use public school as a forum for evangelizing, and let the rest of us pay for their efforts. Of course, they would scream if the Legislature forced them to finance Episcopal, Catholic or even Koran study classes in their Sunday Schools. Wasn't it Jesus who said the second commandment requires of the rest of us to do for them what they refuse to do for anyone else? Later that day the banker came to foreclose on his home because he was one day late on his mortgage for the first time in the twenty-nine years of his thirty year mortgage. The poor man shot the banker in the defense of his home. The law came the next day and imprisoned him. Wherein do you think it is just that the poor man could defend his home from the black man and not from the banker? And Jesus said, “See you not the difference? He shot the black man in defense of his home, but the banker was truly the homeowner until the mortgage was paid. Wherefore the banker, being the true owner of the home, should have taken his concealed weapon and killed the man and his entire family but for the laws of his district which forbid concealed weapons even though it was his second amendment right. And the disciples were amazed by the wisdom of his words. While the disciples were arguing who among them was the greatest marksman, Jesus took up Peter's AR-17 and said. “This is my semi-automatic. Take, share and use responsibly for my sake. For unless thou art prepared for the great day with training and target practice you may be found wanting. Then he said, “These are my bullets. Take load and use them in defense of your homes. For the meek are takers and you create rights for all.” And the disciples did finish their dinner in silence and awe. And Jesus prayed, “Lord pass the cup and the gun to me for I fear no man when I am armed with thy righteousness and my second amendment rights. And my HK sp89.” And when he was finished praying the temple guards came to arrest him. When Jesus' followers saw what was going to happen, they said, “Lord, should we strike with our swords?” And one of them struck the servant of the high priest, cutting off his right ear. But Jesus answered, “No more of this!” And he grabbed his sp89 and shot the high priest in the forehead as was his right to self defense spelled out in the second amendment. Seeing that all the disciples were armed, the temple guard fled in dismay. And Jesus was not crucified on the passover for yea the second amendment implies that with an armed militia there need be no other redemption. The liberals did flee the temple and peace was restored to Israel. Nor did they fear the Palestinians because they were able to stockpile weapons for two millennia before the United Nations sold the Israelites down the river.